The 2017 PDGA Professional Disc Golf World Championships will feature two courses in the Augusta, Georgia area. 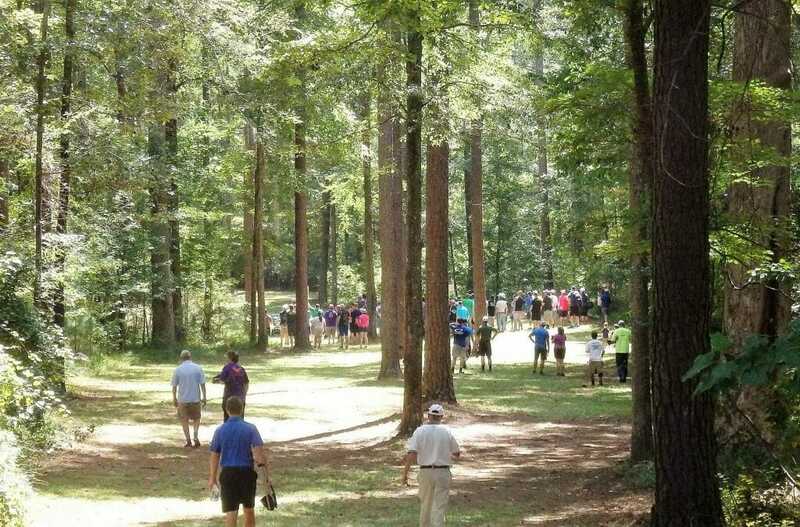 The W.R. Jackson Memorial course at the International Disc Golf Center in Appling, Georgia, has played host to high-profile professional events in the past, while the Fort Gordon course will have only been played in practice rounds by the majority of those competing for the world title. W.R. Jackson is the gold-level course out of the three located at the IDGC. It was originally designed by notable disc golf course designer John Houck and in recent years has been under the care of IDGC Manager and 2017 Worlds Tournament Director Zach Shafer. The heavily wooded course plays up and down the hills of the Georgia piedmont, just north of the fall line in Augusta, and features an abundance of narrow gaps, tunnels, and doglegs, with a treacherously dense rough and out-of-bounds creek for those who venture off the fairways. Played as a 9,681-foot par 68 from the long tees for the Open field and a 9,111-foot par 67 from the short tees for the Open Women’s field, this true championship track is sure to test both the precision and power of the top professionals. The long tees feature three par 5s and eight par 4s, while the short tees feature two par 5s and nine par 4s. The course has played host to a number of premier events in the past — most notably the bi-annual Hall of Fame Classic — but Schafer said that there have been a few adjustments to the course as it gets set to host the first and third rounds of the mother of all tournaments. In what is likely a welcome adjustment for many of the pros attending Worlds this year, hole 3 – one that Nate Sexton alluded to not being a fan of during commentary of the 2015 Hall of Fame Classic — is seeing a significant change as it shifts from a short par 4 to an attackable par 3. The pin placements at W.R. Jackson will stay consistent for each of the two rounds, Shafer said, in order to allow players to maximize practice time and avoid any confusion between rounds. Additionally, drop zones will be added where the creek comes into play on holes 12 and 13, where stroke-and-distance rules had been in play in previous years. One last significant change is that holes 2 and 7 have been switched, breaking up what was once a stretch of six straight par 4s to start the round. Shafer said the switch benefited course flow and would cut down on distractions, as players and galleries walking between are now diverted away from nearby greens. Even with these changes, expect to see the course play quite similarly to what can be seen in post-production coverage of past Hall of Fame Classics. The 2015 Hall of Fame Classic was covered by Jomez Productions, with the second and final rounds taking place at Jackson. To get a sense of the heavier vegetation that will be present this week, check out the 2013 HOFC, when it was held in May. Two particular stretches of the course to keep an eye on are the run of par 4s from hole 4 to hole 7, followed by the par 5 hole 8; and the streak of short par 3s from holes 11 to 13. This first stretch of long holes on the front nine places a premium on finding landing zones that can decrease the difficulty of an approach to the green. The longest hole on the course – a 990-foot par 5 (861 feet from the shorts) — finishes out the stretch and is often described as perhaps the toughest on the course. But appearances can be deceiving, and there’s just as much danger in this section as there are on the longer holes. Each shot features hard-packed dirt fairways and greens that slope down toward an out-of-bounds creek. Landing your tee shot softly and avoiding roll-aways is on the forefront of everyone’s mind here. Hole 18 offers a similar challenge, but one that is nearly 200 feet longer. Players must split some small gaps between trees off the tee, then fly over an OB creek to find the ideal landing area. The next shot plays up a steep hill that bends right to a second landing area, and the fairway then arcs slightly right to left as dense trees line the sides and green. 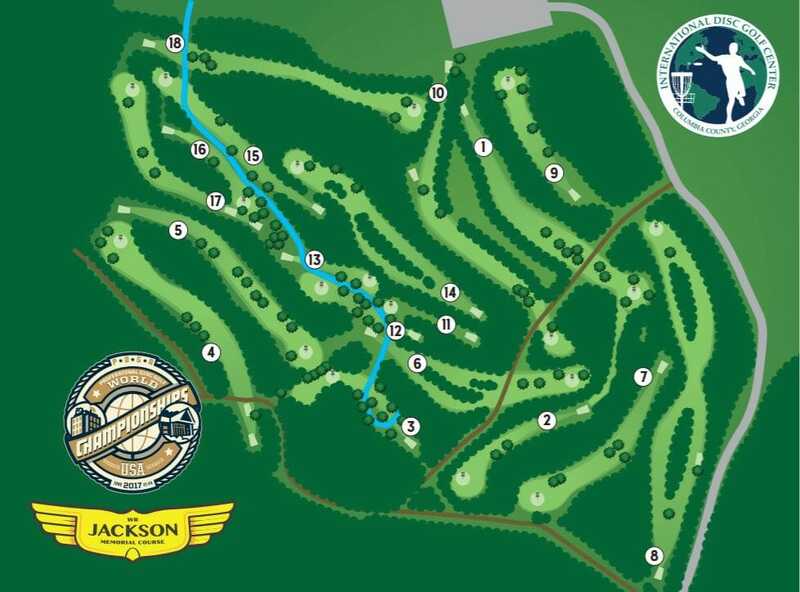 On the whole, the W.R. Jackson course is reminiscent of the 2015 Worlds tracks in Pittsburgh, specifically Moraine State Park and Deer Lakes. Players who can keep it clean down the fairways — or at least keep their cool and scramble in the Georgia heat when they don’t – will be in range for rounds in the upper 50s. Anything more, and hopes for a world title are likely to be lost in the rough. 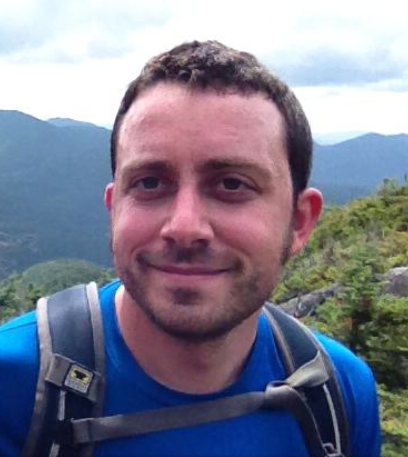 Comments on "Pro Worlds Course Preview: W.R. Jackson Memorial"